I've been contracting part-time for some time now and been able to spend much much less time on the project. This has meant I've not been able to dedicate the time to regular blogging. I'm now spending slightly less time a week contracting so hopefully I'll be able to find the time for a few blog posts one day. 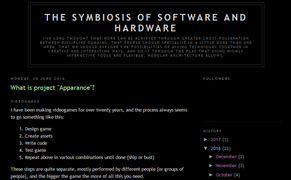 Currently these are hosted externally on my personal Blogger site entitled "The Symbiosis Of Software And Hardware". 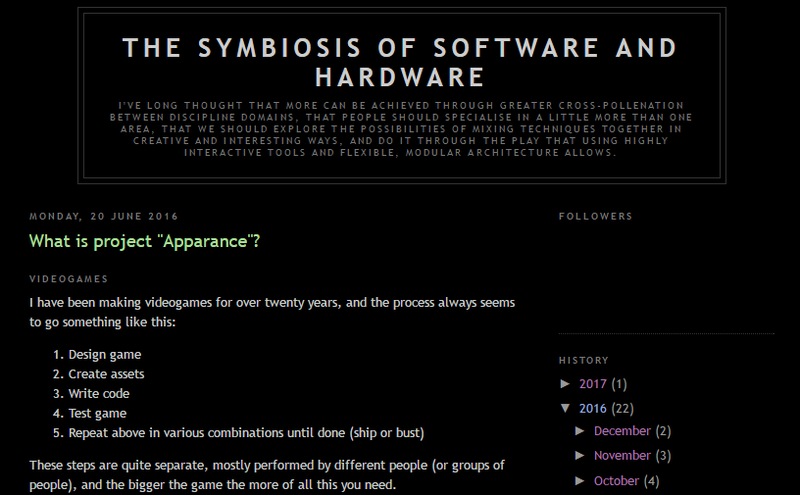 This started as a general purpose blog, leaning towards electronics and computing projects. After some sparse posts about virtual circuitry and ideas of where that could lead I started work on the systems that would eventually become Apparance. Website generated procedurally using the Apparance Processor content compiler.